The Jabra UC VOICE 550 MS is a corded binaural headset (over both ears) designed specifically for Unified Communication deployments. The headset is made for desk-centric professionals who occasionally work from outside the office and need to take the headset with them. It appeals to users favouring the classic leatherette design. This version is optimised for Microsoft Lync & Office Communicator. (Not just the Microsoft operating system, Lync & MOC are specific software, if you don't intend to use with these programmes, just get the standard version.) The intuitive call-control unit attached to the cord allows for fast user adoption.This is a classic-looking headset with soft leatherette padding on the headband and ear cushions producing all day comfort. 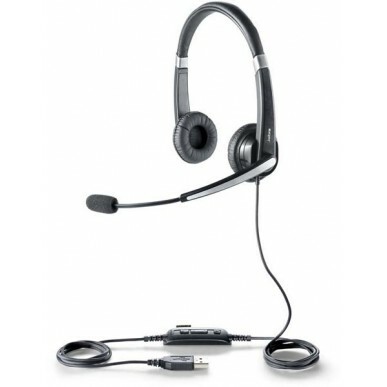 The headset is designed for light-to-medium usage in or outside the office. The headset features superior sound clarity for softphone calls, conference calls, live presentations and other multimedia applications. The microphone supports noise-cancellation, ensuring that the recipient cannot hear background noise from the speaker’s surroundings. This makes the headset suitable for use in louder office environments. Download free drivers from Jabra.com/PCsuite to ensure call-control functionality. The Jabra PC Suite is a plug-and-play software solution that is compatible with all leading Unified Communications Platforms. Jabra PC Suite IT Deployment Tool enables mass rollouts, thereby ensuring that the deployment is cost and time-effective. them. It appeals to users favoring the classic leatherette design. cushions. The headset is designed for light-to-medium usage. suitable for use in louder office environments. A flexible boom arm tip ensures ideal microphone placement. headset to the computer and it is ready for use.